If dogs could design holidays we reckon this would be it. 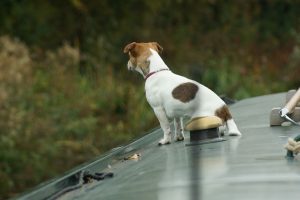 A narrowboat holiday can have all the elements that a dog really enjoys. For a start they can be with you throughout the holiday. There is no deciding what to do with the dog today, they are just part of it all. Getting out for a walk is easy, the towpath is a great place to be. No need to leave the in the car while you visit places, and many of the canal pubs are happy to take dogs. There are of course precautions to take to ensure everyone is safe and happy. Dogs should have a collar and identity tag on at all times (essential when they are away from a home environment). Keep an eye open for roads adjacent to canals, particularly near locks. Most dogs stay well clear of the water, however if you have concerns doggy life jackets can be purchased. Theseare useful not just for the in water support, but are equipped with a handle that makes getting dogs out the the canal easier. Poo bags should always be to hand.